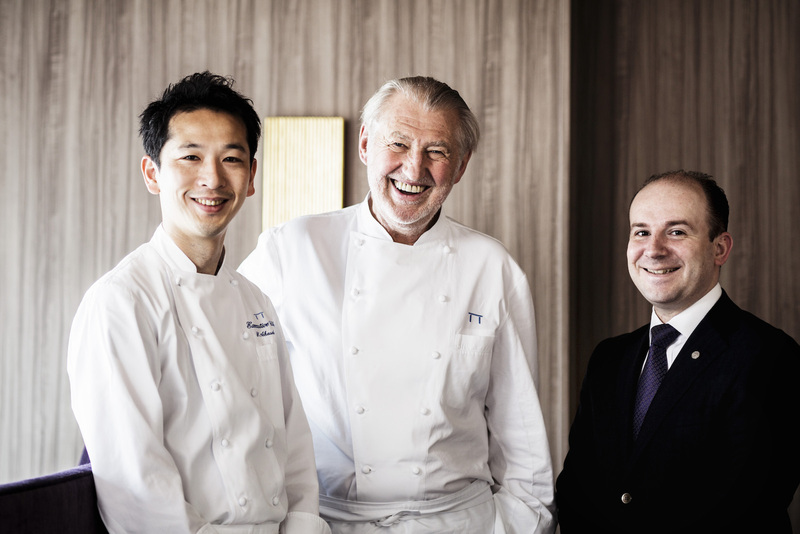 Legendary chef Pierre Gagnaire emerges from around the corner of the ANA InterContinental Hotel’s Club Lounge, just having finished breakfast. Elegant in a sky-blue shirt with his signature scruffy-chic beard, the 67-year old rock star of French cuisine looked to be in as good form as ever despite his constant globe-trotting. He’d arrived in Tokyo just a couple days before, after visiting a string of other cities in Asia. There would be several more stops in other countries before he heads back to Paris, his home, where he apparently spends only several weeks a year due to his busy schedule. The chef’s charismatic looks - tall, with longish white-blonde hair and piercing blue eyes - are well-known to gourmet lovers around the world, especially if they’ve been to his restaurant. 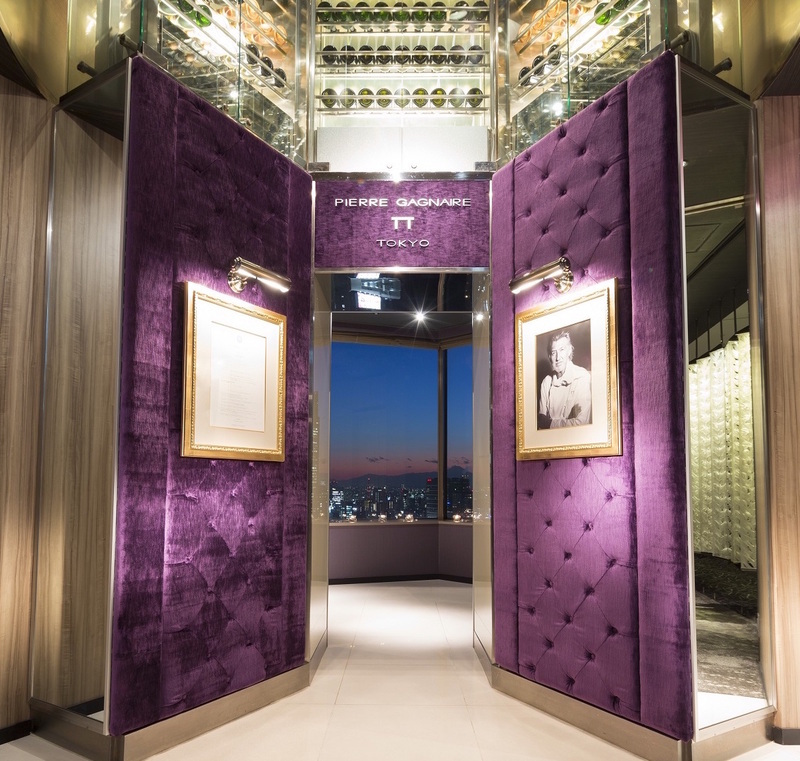 A portrait of the chef graces the entrance at all his eponymous Michelin-starred restaurants, of which there are 12 locations worldwide (he also works on several other restaurants mainly with the French restaurant group Fouquet’s). He’s not the kind of celebrity chef with a TV show, but he’s arguably the most famous, iconic figure in fine dining of our time, adored by fans and fellow chefs alike. In 2015, Pierre Gagnaire was voted “Best Chef in the World” by his peers in a poll by the French industry magazine Le Chef, in which Michelin-starred chefs themselves vote for their favorite Michelin-starred chef. The evening after interviewing the chef, I had the delicious honor of dining at Pierre Gagnaire Tokyo on the 36th floor of the ANA InterContinental Hotel, with the legend himself cooking in the kitchen (and also popping out frequently to talk to guests). 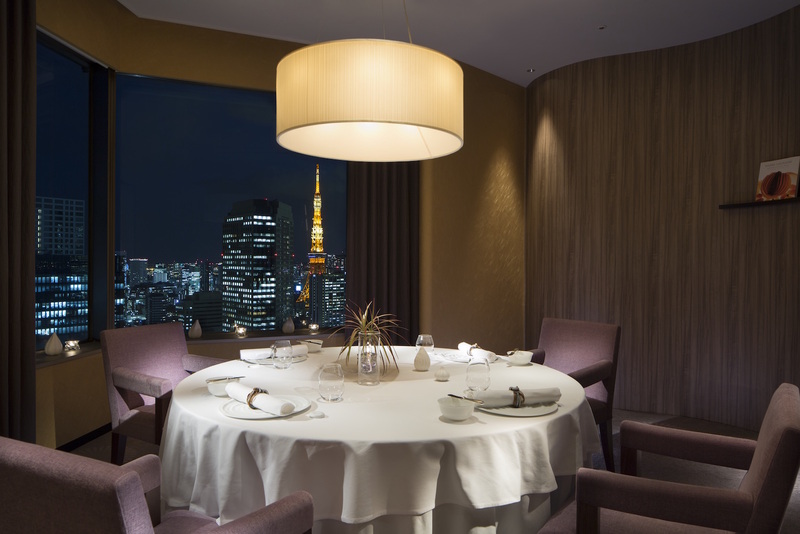 Pierre Gagnaire Tokyo offers this extraordinary dining experience in a beautiful plush interior with romantic lighting and a perfect view of the glimmering city, making this one of the most special "special occasion" restaurants out there. This is more than just eating, but a highly engaging event - and possibly a profound experience - that should be a requisite for anyone to consider him or herself a connoisseur of haute cuisine. He’s known for his unique “course within a course” style, in which multiple small dishes comprise each course; for example, the dinner started off with a variety of bite-sized amuse bouche, then his signature “cocktail de poche” appetizer, made up of five seasonal dishes served at once. It’s almost futile to try to describe each dish in intricate detail, as there’s just so much going on, while the whole effect is much more than the sum of its parts. As he describes it himself, he tells stories with his food. It is “food that is not just food,” food as art. Below, Chef Gagnaire shares his thoughts on topics ranging from movies to expensive sushi, and touches on deeper issues like his link with Japan, and the importance of seeing the world with your own eyes. With a total of 15 or more restaurants around the world and counting, you’re always travelling around the world. [I travel] Too much. But I have no choice. If you want to keep the quality, it’s impossible to stay in the office with just computer and skype. You must travel, you must see the people, see the guests. And most importantly, you must spend time with your team. That is the key of our success. It’s not the problem to take the plane. The problem when you travel - I think everybody can say this - it’s before you take the plane. It’s the day before, when you know you must wake up; not too early, not too late. It’s a lot of stress. Once you’re on the plane, it’s no problem. Have a glass of champagne and then sleep. Do you actually eat on the plane? It depends. I try not, but when you’re tired, it’s a good way to relax. The food is not always fantastic, but companies like Air France, ANA, they make an effort to offer something with real quality. But I know it’s difficult to prepare food that is tasty on a plane. Do you watch movies on the plane? No. I hate that! For me, a movie, you go where there’s a real screen, a big one. With popcorn. You take time and you relax. Or not! Because sometimes, today, the movies tell about the world, and the world is not always fantastic. It’s a good image of our society. Any good movie that you saw recently? It was an old French movie. We prepared some dinners for the Festival de Cannes (Cannes Film Festival), and they asked me to choose a director. So I chose Claude Sautet. This director was very famous in the '80s. He produced some movies that explain the French society at the time. I love this man because he’s very elegant. The quality of the music is totally extraordinary. He describes the French society. It’s very interesting. When you’re in Japan, do you try to have mostly Japanese food or all different kinds? Japanese food. Always. Japanese food is extraordinary, so to have the opportunity to taste that in this city, or in Kyoto or Osaka, it’s always a big experience. Oh, so every night, do you try to go to fine dining establishments? No no no. Every night, I stay in my restaurant. And I try to receive guests. I try to spend time in the kitchen. Alors, tomorrow I have a meeting with a friend, so I will eat after the service. But when I am in the city, it’s not easy for me to go outside. Because I know that I have a deal with the company. I have a deal with my customers, my guests. And I must stay here. It’s sometimes difficult. The first time I came to Japan was around ‘86, and I didn’t know the country. Now, I feel it’s time to stop and to take a few days off to visit [around Japan]. Every country is incredible. Last week I was in Vietnam. And before I was in Korea. You’ve been called the ‘Picasso of the Kitchen.’ Do you like that term? Well, it’s not bad! Mais, I try to be honest in my work. For me, my thought is basic. People come [to my restaurant], they must be happy. For me, that is the big thing. When I came the first time to Japan, it was very emotional. When I came and tasted the food, I understood immediately what it was; the presentation, the spirit behind the product… I was in the same [state of] mind. Alors. That is my link with the Japanese culture. The food is not only food. Behind that, you have relationships with the universe, with your past, with your family, with your story, with yourself. The way you eat is very intimate. So cooking is a form of expression for you? It’s the only reason why I continue to do this job. Because it’s a real form of expression. Is it true that Japanese cuisine inspired your multi-dish style? Honestly, no. My style, when I came to Japan around ‘85, ‘86, I [already] worked for myself for 8 years. Alors, my story was not finished, but it wasn’t the beginning of my [culinary] life. [When I began my career] Immediately, I felt it was not possible to continue to work like I learned. I felt that it was important to put my art, my brain, my life into it. At the time, it was like therapy to cook. And when I arrived in this country, immediately, I felt it was that. The food is not just food. It’s like the poetry, the art of the flower, it’s a kind of philosophy. For many years, I worked alone. I was alone in my work, my thinking. Today, I share. It’s always with somebody now. I need my team. We share our emotions, our culture, our knowledge. Are you conscious about making your food healthy? What do you think? I eat my food! (pointing at himself). It’s not only the sports! Well, I’m lucky with that. I am fussy to choose [what I eat]. For example this morning, I ate smoked salmon, and it was very good. But very often at hotels, smoked salmon, it’s a disaster! Today, one needs some expertise to immediately know if the product is good or not good. And I try to eat only good products, because I have the chance to choose. I love croissants, but I don’t eat croissants. Because to have one croissant is good. But eat one, then you must have 40 or 50. Please! Why eat that? Fresh orange juice, it's OK. But in the bottle, it’s a disaster. Although you love Japanese food, you’ve said before that you don’t want to have much Japanese elements in your cooking outside of Japan. Why is that? Absolutely. Because it’s too easy… We use a lot of Japanese products. But it’s the bamboo, zucchini, eggplant, products like that. Not easy products like wasabi, soja, shiso… I like that. But it’s too trendy! For me, a trend is just a trend. How do you feel about trendy Japanese restaurants abroad, in cities like New York and London? Easy to eat. Pick up with your fingers, like sushi... It’s like pizza. The problem is that it’s not easy to eat good sushi. The most expensive sushi I’ve seen is in Courchevel (France). One piece… 80 euros? It’s crazy. No. But my wife did (laughing). Actually, it’s like hamburgers. McDonalds. It’s the same when you eat noodles in a cup. This subject is very important. Today, the trend is to be vegan, vegetarian, bio… OK! But that’s a problem for a very small percentage of society. There are many people who cannot pay [for food]. Today, food is a big issue. It’s for that reason that I work with many charities. Because with the charities, we try to imagine the future. In one future, we might just eat little pills [in place of food]. You see, 30 years ago, when you go to the fish market in Tokyo, 80% of the fish was wild. Now, 80% of the fish are from farms. It’s like that. When I first began to work, I felt it wasn’t necessary to eat too much to stay alive. You eat olive oil, you eat figs, and it was enough. I was very concerned with the product. I wanted to work with very rare and expensive products, but it wasn’t to make a lot of money. It was to respect the product and to offer something of another level - on an artistic level. When you procure something, you have a responsibility. For us, it is a responsibility to use a product that is a little bit rare. For me, it’s totally crazy when you have a French chef, [who gets] a turbot like that (hands wide apart) and at the end, you have something like that (hands closely together). It’s not a turbot anymore! They cut and cut and cut. It’s a shame! You must respect the product. You must respect the society, the world. What do you think about the ban on foie gras? Like in California. Oh, forget that. It’s idiotic. Please. Mais! The world is changing. I must be careful when I’m not speaking in my language, not to be miscommunicated. Well, the world is getting very closed. We’re missing freedom. Everybody wants to control everything. What you eat, your relationships... The other day, I discovered that my assistant had all my photos on his computer! So you have a smartphone? Oui! It’s new for me. Mais, it’s a way to keep track of things. I read that you didn’t approve of people taking a lot of photos of food at your restaurants. Oh, it’s not a problem. It’s not important. But the problem is - it’s the same with when you travel - when you have a camera, you see the world through the camera. And it’s not a good way to discover the world. And it’s not a good way to feel your emotions. And it’s the same at restaurants. Before you eat, immediately "tick tick tick!," you take photos with your camera. No! Take your time, play with your plate, try to appreciate the atmosphere. Photos are just an image. Life is not an image. For example, I refuse - hate- journalists who send me questions by email. I say no. For example, today; you came in, we meet, we have time to speak. Bon, alors. We’re here in this room, we feel we are alive. That’s very important. And today, we need that. I hope we come back to that. I hope people reconnect by this (tapping the table). And your thoughts on the whole Facebook and Instagram culture? Ah no! I play with that. We must use it. It’s good for your training, because it’s a fantastic way to connect with people. Well, I’m lucky. I have people who do it for me. Mais, to be honest, I’m not obsessed by it. I never check. Somebody checks for me. How do you work on the menu at each restaurant location? It depends on the location. Here, Yosuke (Akasaka, Head Chef) is very courageous. We’ve worked together for 15 years. When I come, we discuss the products. I try to give my opinion about this dish or that dish, and he sends me menus. Before, I used to write all the menus. Now, he sends me the menus, and I check and revise. Then we have a conversation. It’s sharing. Do you think Yosuke knows how to express your vision? It’s impossible to consign your vision. It’s not possible. You can help somebody, you can share your experience. But you cannot translate your talent. There are chefs like Robuchon, who are very strict. Moi, I’m not like that. I think that if I want the people to be happy, they must be a little bit free. I’m there because I’m behind that. They must translate the expression of my sensibility. When you work with somebody, it’s like a wedding. What is a wedding? Well, it’s two persons, who have a fundamental option [choice]. You can grow, you can work. If you want to have a strong story, everybody must be comfortable. In the kitchen it’s the same. You must be comfortable. He must have his own personality. That is important. It’s a mix. It’s always a work in progress. For example, Yosuke here - now that he’s older - finally, he’s beginning to be less Japanese. It was too Japanese before, his food. It was very small, very tidy. Now, it’s more generous. I noticed that this week! Do you have a favorite kitchen utensil that you take with you everywhere? No. My favorite utensil is actually a pen - or no, pencil. I need to write and erase. Because before cooking, moi, I spend a lot of time. I live alone. I’m lucky to have a wife and kids, but I live alone and I need to be quiet. If I want to continue creating, it’s necessary to take time to be focused on my work. Yes, I have a knife. But I have no obsession. Life is too short to be obsessed. There are so many possibilities to meet people, to share experiences. My only obsession is to offer something that is great, that is tasty; something that will produce a small emotion. It’s not just the food. It’s the story that you tell along that. For reservations, call 03-3505-1185 or click here.